Indulge in the front row seats to find peace and visual delight as the beauty of the bush reserve meets the Pacific Ocean. Watch the sunrises, the moon rises and watch the whales go by. The Copa Cabana is a free standing residence, situated on the front half of a block which houses a second dwelling behind and completely separate from the Cabana. The Cabana pool and residence are exclusively for your use only with its own private access. Take a sauna and follow it up with a refreshing dip in the 10 meter salt water pool and soak up the sun. The loft isn't a second bedroom - there is a day bed but it is not suitable for sleeping on. This is a couples only property. 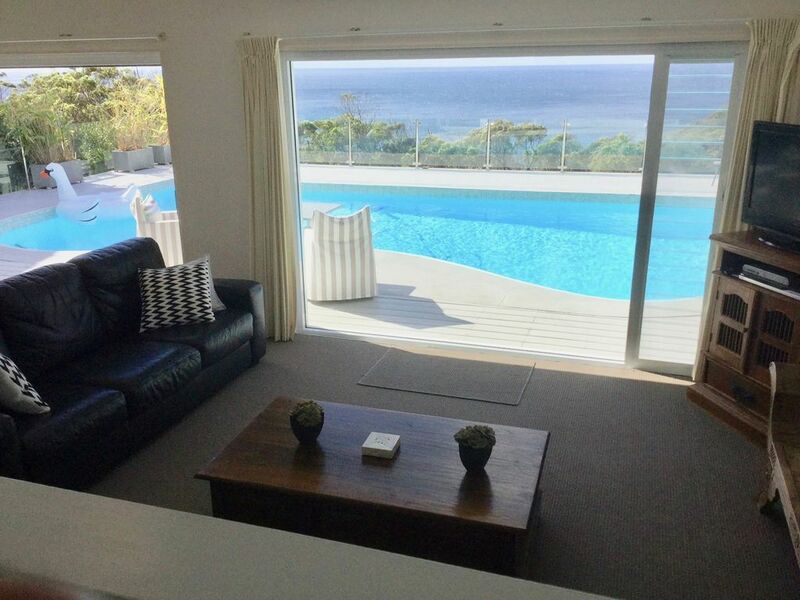 This cabana is located up on the headland in Copacabana with a direct and uncompromised view to the ocean and north towards Terrigal and Newcastle. The beach its a short car trip down the hill to the sand and shore, no more than 2 minutes drive. If your the bushwalking type simply step out of the garden in the bush reserve and make your way to Winnie Bay Rock Platform. A short walk to the headland (towards the beach) will bring you to the Captain Cook Lookout - from here you can see Sydney Tower, Bondi and Sydney Heads. The quiet of Copacabana is enticing. But if you crave the cafe life there are great little local cafes and restaurants and the nightlife of Terrigal is only 10 minutes away. Beaches - Lots of them! The property, including the pool and sauna, is regularly maintained outside of the times at which it is booked. However, in the event of an emergency fault to the pool, sauna, electrical supply, plumbing matters or other facility, trades-persons may need access to the property. This will be avoided unless absolutely necessary and time spent by such persons on the premises kept to a minimum. The owners cannot be held responsible for critical repair work and will not offer compensation for such emergency responses - particularly if requested by tenants in response to a problem they report. 1. There are to be no parties, no bucks/hens weekends nor any other types of functions held at this property. 2. Each guest is expected to behave in a manner which is conducive to the safety, comfort and convenience of other guests within the property and surrounding properties. 3. Disturbance of neighbours (immediate neighbours have office contact details), including excessive noise, is prohibited and will result in termination of rental and loss of bond. Our neighbours are reasonable people who have the right to a peaceful nights sleep at all times. They will call the security company if they are disturbed by nuisance noise or offensive behaviour. If a complaint is registered, our security service will arrive. This includes outside noise after 10pm. 4. A breach of house rules includes: any extra people on the premises at any time; noisy, offensive and/or unruly behaviour; damage to or destruction of property; improper or unseemly conduct; any act or omission which, in the opinion of the Manager, adversely affects or brings discredit upon the Manager, the owner or other guests. 5. The property is let for only the number of persons specified and agreed in email correspondence. These particular individuals are referred to as guests. There must not be any additional person on the property at any time. 6. It is a requirement that you leave the property in a clean condition, similar to that in which it was found. Your rental includes a general clean. Excess charges will apply if you leave a mess. You are responsible for the cost of stain removal for walls, carpets and upholstery, such as beer, wine, food, muddy feet, extreme sand or excess cleaning required for the kitchen. ALL kitchen items must be put back where they belong, please make sure the dishes are clean and put back where you found them. Please DO NOT rearrange kitchen items. ALL rubbish needs to be taken outside. Excess rubbish that does not fit in the bin must be removed . The property has a spa bath installed please ensure that it is left in an acceptable state of cleanliness. An extra charge will be incurred if extra cleaning required. Please leave the BBQ clean or cost for removal/cleaning will be charged. Damage, Breakages, Theft and Loss are the tenants’ responsibility during their stay and if noted on inspection by our cleaners/managers a charge will be applied. 7. This is a NON SMOKING residence. Smoking is not permitted indoors. Do not smoke inside any area of the residence. A surcharge of $350.00 for smoke removal will be charged if smoke is detected. If you wish to smoke please do so outside. Please be a courteous smoker if you must smoke (outside only) and ensure the wind does not blow it inside. DO NOT leave cigarette butts, dirty ashtrays or put butts in the gardens or planters. A surcharge of $150.00 will be incurred. 8. Pets are not allowed on the premises unless the property management/owners have agreed expressly. 9. The owners do not accept or take any responsibility for guests’ personal property. Please ensure you have taken out appropriate insurance coverage as required. Items left behind by guests can be sent to the primary guest's address. A handling fee of $25 plus costs for shipping will be deposited from the credit card provided on this guest registration form. Please close and lock ALL windows and doors on your departure day or when you are absent from the property to maintain security and prevent rain and water damage. 10. When any guest enters the property they shall be deemed to have agreed to be bound by these conditions. 11. The primary guest acknowledges having read and understood the terms and conditions and acknowledges receipt of a copy of the terms and conditions and by execution of the Guest Registration form agrees to be bound by them and be responsible for compliance with the terms and conditions by other occupants of premises. 12. Check out time is strictly enforced. Late check outs may be negotiated and paid in advance. Breaches of this condition will result in an automatic cost of $60 per hour (or part there of) being charged to the registered primary guest credit card. 13. Cancellation: the strict AirBnb policy applies to this property. PLEASE NOTE: Should an additional charge be made, you will be notified of the amount and when this will occur via th AirBnb host site. Loved our weekend away at the Copa Cabana. The view from the pool and inside was breathtaking. We couldn’t get enough of our stay. Would highly recommend. Walked into the cabana expecting better as the fridge was quite small, no dishwasher, no washing machine (Paul’s daughter offered to wash our clothes), pool was very dirty and cold. There was grey hairs, brown hairs and short hairs all over the bed sheets and pillows. Stains on the quilts and a spider upstairs on the daybed. We had called Paul but could not get through. Had his daughter return my call and say the sheets had been cleaned prior to arrival. She then came in and unlocked a cupboard and replaced the sheets which still ended up having a dried flakey stain on it. We had filled up the spa and turned it on, then to find there’s grime floating around. Emptied the spa and then filled it up again and got in and the stench of bleach was all over me. There’s an expectation.. other than that the sauna was great. Amazing views, very clean, great facilities such as pool, spa and sauna. Truely the most perfect place to stay. The view is breathtaking. The pool was very clean and great to swim in. The sauna was perfect as well as the spa. A very pieceful and relaxing place to get away from your busy life. If you stay here you definitely won’t be disappointed. We've stayed at Copa Cabana for a week. The cabin is in a great place, with the breathtaking view of the ocean, amazing nature just a few metres away (we even saw a couple of brush turkeys wondering around). Inside you have everything you night need/want - a couple of cosy sofas, a nice bed, a kitchen and a spa - even a sauna. There are, though, a couple of things that were annoying: there is no pergola or similar outside, so if it rains (which it did) - you are stuck inside. The microwave is in the "LOCKED" mode and there's no instruction on how to unlock it. Someone tall shaved his face while having a shower. How do we know? 'Cos there're hairs on the wall. One of you previous guests had longish grey hair. How do we know? 'Cos these are everywhere - on the bed cover, in the bathroom, even on the dining table! The spa doesn't look clean at all and is very worn out - maybe because of the filthy grout around it. The outside day bed is simply very dirty and has a lot of stains, and so are the deck chairs. The day bed had a strange bump right in the centre. Turned out someone put a deck chair mat under the mattress. We found it all quite unpleasant, particularly considering the strict instructions we received re the rules we should follow while visiting. We don't mind to follow the rules - but shouldn't the property owner? Cannot recommend this place enough, absolutely beautiful, has everything you need and more .. even has a sauna!! Thanks Paul for great communication and providing such a good stay, I will defo be back! Wonderful find! So glad we chose The Copa Cabana for our break away as it was perfect for what we needed. The view is fantastic, the cabana very comfortable and private. Although the pool area can be seen by the neighbors it didnt worry us as it was a very quiet time of year. Loved every minute of our stay and will be back! PS-Thank you Paul for the lovely wine and easy transaction with deposit/payment and keys.